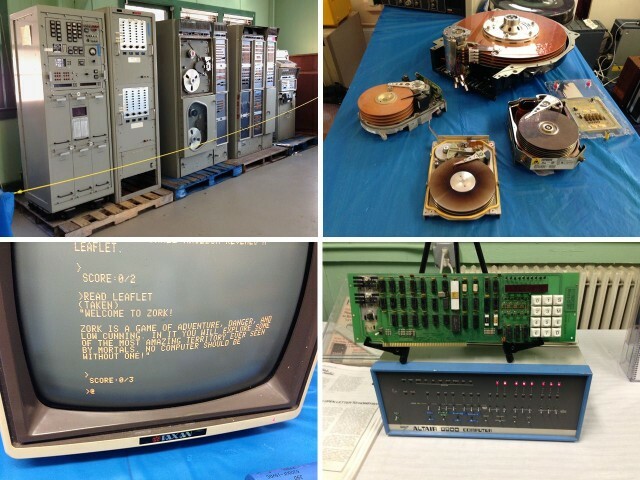 A Univac mainframe, early hard disk drives, Zork, and an Altair 8800 at VCF East 2014. What do you get when you combine several hundred serious geeks, two large rooms, five decades’ worth of vintage computers, and a weekend in New Jersey? The Vintage Computer Festival East, of course! The ninth running of the VCF East was held April 4-7 at the InfoAge Science Center in Wall Township, New Jersey. Hosted by MARCH, the MidAtlantic Retro Computing Hobbyists group, the 2014 show saw the largest number of exhibitors and attendees for a VCF East yet, with exhibit halls expanded from one to two rooms and three days of lectures and seminars available for attendees. 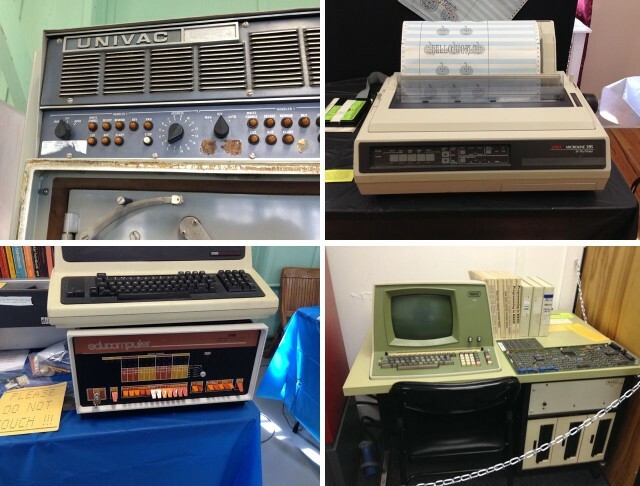 The show featured a wide range of computing history, from a seminal, room-size UNIVAC computer, through the DEC, Prime and HP minicomputer era, to the workstations and home computers of the 1970s and ’80s. Univac nameplate, Okidata printer, DEC PDP-8 and a Wang “desktop” computer. Interest in the computers of yesteryear continues to increase, and is reflected in a growing number of vintage computing events around the country. From the original Vintage Computer Festival back in 1997 — and even before that, KansasFest in 1989 — intelligent, graying, sometimes portly computer fans and their families have grown this market to multiple shows worldwide requiring 1.21 gigawatts of electricity each year to power the exhibits. The VCF is a hands-on exhibition, with (where possible) working systems that attendees can interact with or observe in action. Apple made a good showing at VCF East, starting with a number of Apple 1s. MARCH has a Mimeo replica in its permanent collection, and one exhibitor displayed an original model (signed by Woz) running Zork from a CompactFlash drive! How cool is that? There were a few Apple IIs, a working Lisa 2 and several tables of Macinti. My own Vintage Mac Museum was one of the exhibitors, and I showed off an SE/30, PowerBook 170 and Color Classic, along with a Picasso Dealer Sign. An Apple 1 plays Zork; vintage Macs, Picasso dealer sign, and Mac 512k with clear sides. Across from my table was a DEC PDP-8 minicomputer (compact and portable for its day), equipped with a paper punch-card reader. The punch-card reader was interfaced both to the PDP-8 and a modern laptop via a parallel cable (and specialized interface), allowing punch-card programs to be archived direct to disk. Towards the end of the show one MARCH member stopped over with a stack of punch-cards and proceeded to do a paper to USB flash drive conversion. Digital storage-wise, that must be one of the greatest generational leaps in history! But returning to Commodore for a moment: Apple fans may be loud and many in number, but Commodore diehards are among the most loyal, dedicated worshipers of old silicon that exist. Many original company engineers were exhibiting and speaking at the show, and one exhibitor flew in from Switzerland to show off a number of rare systems and prototypes which never saw the light of day. A network of Commodore 64s was setup playing space shoot-up games, the venerable PET made several appearances, and every variant of Amiga possible was on display. A Commodore 64 computer network, and classic Commodore PET. In fact, a new version of the AmigaOS – that runs, ironically, on old Apple PowerPC hardware – is still being developed to this day. And I thought Cult of Mac members were devoted! Got the vintage computing bug? Next up is the VCF Southeast 2.0, happening May 3-4 in Roswell, Georgia; after that, KansasFest episode 26 happens from July 22-27 in Kansas City, Missouri.